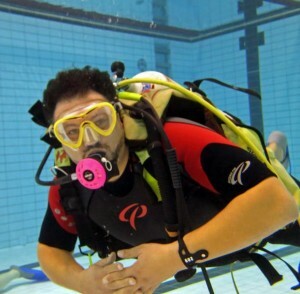 The best way to see if you like the sensation of being underwater and want to learn to dive is to come along to a try dive session at Ironmonger Row Baths near Old Street. At 7pm you will receive an introduction to scuba kit and at 8pm you will get in the pool with an instructor. This is a great value evening out and, if you decide to learn now, we have a seven week course for beginners that starts on Thursday 9 May 2019. 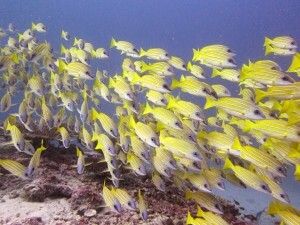 It is exciting –seeing marine animals, wrecks, reefs and seascapes. Relaxing – floating weightless underwater helps unwind from day to day stresses. Peaceful – the silent world, and floating among fish can make you feel calm and serene. 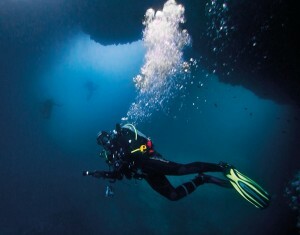 Challenging – diving is an adventurous sport and there are skills that take perseverance to learn. Educational – in addition to ‘diving’ you inevitably learn about other things like weather, physics, biology, maritime history, seamanship, marine ecology – and it is all fascinating stuff. 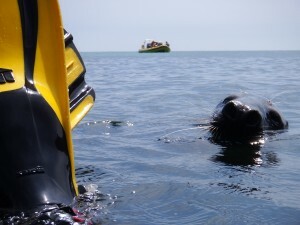 Really good fun – scuba is a social sport, organised as a group activity with everyone having a buddy for the dive. It is enjoyable to both plan and to do and also makes for great conversation afterwards. Nearest thing most of us will get to ‘flying’ – from hanging motionless in mid water to whooshing along a seascape in a current – yes, you can fly! It takes us places we have never been before – from the Scillies to the Shetlands in the UK or from the Med to the Maldives in international waters – your holiday’s destinations are often new and exciting. Immersing in another element – scuba diving is the nearest thing at most of us will get to simply entering into a whole new world.